UCLA’s Brett Hundley was (conveniently?) omitted by Bills GM Doug Whaley in his recent rundown of the draft’s second tier of quarterbacks. The build up is (almost) over. ¶ The 2015 NFL Draft begins Thursday night from the Auditorium Theatre in Chicago, ending months of speculation, rumors and outright guessing as to what all 32 teams will do. ¶ The most emphatic answer Buffalo Bills General Manager Doug Whaley gave earlier this month during the team’s pre-draft luncheon came when he was asked whether he felt there was too much time between the end of the college season and the draft. ¶ “Yes! No doubt about it,” Whaley said with as much energy as anything he spoke about that day. “I mean, I feel sorry for you guys. You have to come up with different pieces every day and it’s just overkill … To tell you the truth, for us, we’d like the draft right after the combine and we’d be fine with that.” ¶ The wait for Bills fans will be even a little bit longer, as the first round is expected to be quiet for the team, which isn’t scheduled to pick until No. 50 overall rolls around in the second round Friday night. ¶ Here is The News’ final attempt at forecasting what the first round will look like Thursday night, along with each of the Buffalo Bills’ selections over the three-day event. 1. Tampa Bay Buccaneers. Jameis Winston, QB, Florida State. Plenty of smoke that Winston could fall out of the top spot, but ultimately no fire. 2. New York Jets (projected trade with Tennessee). Marcus Mariota, QB, Oregon. New Jets GM Mike Maccagnan has said recently he’d rather move down than up, but I call smokescreen on that. To move up for a franchise quarterback, the Jets give Tennessee the No. 6 overall pick, a second-rounder in 2015 and a 2016 first-rounder. 3. Jacksonville Jaguars. Leonard Williams, DT, Southern California. Staying put and having the draft’s best defensive player fall to him is a solid play by St. Francis product David Caldwell, the Jaguars’ general manger. 4. Oakland Raiders. Amari Cooper, WR, Alabama. Getting a true No. 1 receiver for budding franchise quarterback Derek Carr should be the top priority for the Silver and Black. 5. Washington. Dante Fowler Jr., OLB, Florida. Fowler has the ability to play multiple positions and is just scratching the surface of his potential as a pass rusher. 6. Tennessee Titans (from New York Jets). Kevin White, WR, West Virginia. If you’re going to be all in with Zach Mettenberger, as the Titans are in this scenario, it makes sense to get him a No. 1 receiver. 7. Chicago Bears. Vic Beasley, OLB, Clemson. Bears are moving to a 3-4 defense and need outside linebackers. Beasley is one of the best in this draft class. He’ll give them a pass rush off the edge. 8. Atlanta Falcons. Todd Gurley, RB, Georgia. Gurley is said to be the best running back prospect to enter the draft since Adrian Peterson. With that being the case, the Falcons keep him in state. 9. New York Giants. Danny Shelton, DT, Washington. The Giants finished 30th in the NFL against the rush last season. Shelton should help improve that number. 10. Minnesota Vikings (projected trade with St. Louis). Brandon Scherff, OT, Iowa. Scherff has the ability to play all five positions on the offensive line. 11. St. Louis Rams (projected trade with Minnesota). La’el Collins, OT, LSU. The Rams address the offensive line in the first round for the second straight season. Collins can start at either right tackle or kick inside to guard. 12. Cleveland Browns. DeVante Parker, WR, Louisville. The Browns need a No. 1 receiver with Josh Gordon suspended for the year. 13. New Orleans Saints. Shane Ray, OLB, Missouri. The SEC Defensive Player of the Year, Ray is another edge rusher with the versatility to play in any scheme. 14. Miami Dolphins. Breshad Perriman, WR, Central Florida. Perriman’s sub 4.3-second 40 at UCF’s pro day has shot him up draft boards. His father, Brett, played one season for the Dolphins. 15. San Francisco 49ers. Trae Waynes, CB, Michigan State. Plenty of needs for a team that feels like it’s falling off a cliff. Getting the top cornerback in the draft at No. 15 is a good break. 16. Houston Texans. Andrus Peat, OT, Stanford. Like with several of the other top offensive linemen in this draft, Peat might be best at guard. 17. San Diego Chargers. Melvin Gordon, RB, Wisconsin. University at Buffalo product Branden Oliver will slide into a third-down role with Gordon in the fold. 18. Kansas City Chiefs. Jaelen Strong, WR, Arizona State. Jeremy Maclin gives the Chiefs a starting-caliber receiver. Strong gives them another one. 19. Cleveland Browns (from Buffalo). Malcom Brown, DT, Texas. Has the ability to play in a 4-3 or 3-4 scheme, which is sure to appeal to Browns coach Mike Pettine. 20. Philadelphia Eagles. Phillip Dorsett, WR, Miami. Six receivers in the top 20 picks may be a stretch, but Dorsett has the speed that Eagles coach Chip Kelly covets. 21. Cincinnati Bengals. Ereck Flowers, OT, Miami. Back-to-back Hurricanes come off the board. Flowers is a massive (6-foot-6, 329 pounds) road grader who excels in run blocking but will have to shore up his pass blocking. 22. Pittsburgh Steelers. Byron Jones, CB, Connecticut. An incredible athlete, Jones set a world record in the broad jump at the NFL Scouting Combine with a leap of 12 feet, 3 inches. 23. Detroit Lions. Arik Armstead, DL, Oregon. Armstead can come in and learn from one of the best in Haloti Ngata. 24. Arizona Cardinals. Bud Dupree, OLB, Kentucky. Another crazy-good athlete, Dupree had a 42-inch vertical and ran a 4.56-second 40 at the combine. He could be a steal here. 25. Carolina Panthers. D.J. Humphries, OT, Florida. Charlotte native comes home to protect Cam Newton. 26. Baltimore Ravens. Kevin Johnson, CB, Wake Forest. Johnson took too many penalties (nine over the past two seasons) and isn’t a great tackler, but has the man-coverage skills that should make him a first-round pick. 27. Dallas Cowboys. Marcus Peters, CB, Washington. The Cowboys haven’t been shy about signing or drafting players who come with character red flags. 28. Denver Broncos. Cameron Erving, C, Florida State. Protection for Peyton Manning is always a good idea. 29. Indianapolis Colts. Landon Collins, S, Alabama. Colts get good value with the best player at a weak position. 30. Houston Texans (projected trade with Green Bay). Bryce Petty, QB, Baylor. Feeling like they can get better value in the second round, the Packers move down and Houston grabs an in-state quarterback who can apprentice for a year behind Ryan Mallett and/or Brian Hoyer. To move down, the Packers pick up Houston’s second- and third-round picks. 31. New Orleans Saints. Nelson Agholor, WR, USC. After trading Jimmy Graham and Kenny Stills, the Saints need to restock some weapons for Drew Brees. 32. New England Patriots. Randy Gregory, OLB, Nebraska. A positive drug test at the combine slides Gregory almost out of the first round, but Bill Belichick rolls the dice that Gregory can overcome his problems and reach his potential. 50. Buffalo Bills (second round). 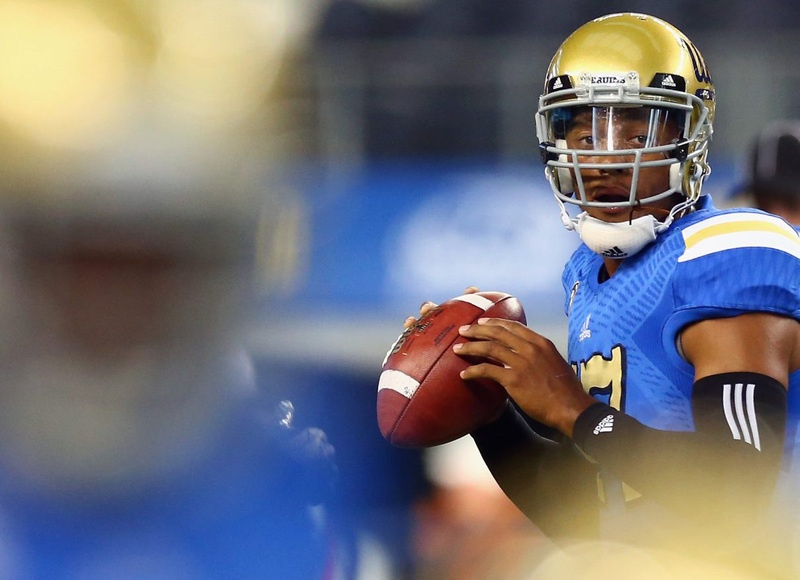 Brett Hundley, QB, UCLA. During a recent interview with WGR 550, Bills GM Doug Whaley conveniently forgot to mention Hundley when discussing the second tier of quarterbacks available. Maybe he doesn’t feel like Hundley belongs there, or maybe he just wants people to feel that way. Hundley has all the physical tools but needs work on reading defenses and getting through his progressions. He would be under no pressure to start as a rookie for the Bills, giving him the time to work on those very things. 81. Buffalo Bills (third round). D’Joun Smith, CB, Florida Atlantic. Smith answered any questions about his speed with a 4.45 40 at the combine and backed that up with a 4.42 at his pro day. Rex Ryan loves his cornerbacks, and the Bills add depth at a position Whaley said he likes to draft every year. 155. Buffalo Bills (fifth round). Nick O’Leary, TE, Florida State. The John Mackey Award winner as the nation’s best tight end slips because he’s not a great athlete, but he’d give the Bills some needed depth at his position. 188. Buffalo Bills (sixth round). Chaz Green, OT, Florida. Green dealt with injuries during college but has potential to be another Seantrel Henderson-type find if he can stay healthy. 194. Buffalo Bills (sixth round). Max Valles, Edge, Virginia. A pass rusher for Rex Ryan to mold. 234. Buffalo Bills (seventh round). Trey DePriest, ILB, Alabama. A tough inside linebacker, DePriest comes with a winning pedigree and can fight for a reserve spot along with potentially helping on special teams.